I’ve recently had contact with Richard Gardner, of Richard Gardner Antiques about the sale of Mindum’s Hinson shoehorn from 1600. Permission has been given to Richard for the catalogue to quote me extensively, and the website provides links to the catalogue and the relevant pages of this blog. The sale page is here. The Featured Image is Richard’s copyright. The usual disclaimer applies, I have no financial interest in the sale but in this case there is a debt of gratitude owed to the current vendor for trusting me alone with the horn and a camera for four hours one day. Which I did accidentally last night while looking for examples of refectory tables with cleats that pass through the apron frame but aren’t attached (for the record, there’s one in The Great Oak Room in the Red Lodge, Bristol). That’s three months short of ten years. We were there in April 2006. The last three frames of the set are William bloody Morris’ bloody powder-bloody-horn made by Robart bloody Mindum in 16-bloody-01. * Do you know how much time I’ve spent trying to get a clear photo of the powderhorn in the intervening time? 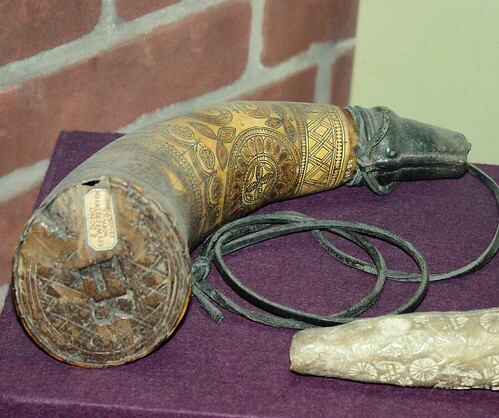 The museum placard doesn’t help: “Powder horn made for William Morris, 1601.” If you didn’t know it was by Mindum, you wouldn’t have learned much because the inscription is turned towards the wall of the cabinet. For whatever reason, it didn’t trigger the Mindum alert at the time and didn’t stick in my memory. Construction is classic powder horn. The base is pressed/glued in because the last thing you want to have if the powder catches alight and goes off is a nailed-in base causing compression. Having third-degree burns still beats losing a leg in the ensuing explosion. The moulded leather collar and carrying thong are probably original. Like on the 1600 Hinson shoehorn, the initials of a previous owner are branded on the base. The owner in 1888 was Rev W F Creeny who donated it to the MoL, so we know it was sometime prior to that. The design elements are the same as on his shoehorns, with bow-ties, triangles, foliage trefoils, scroll-work and flowers, although the inscription is done inside a frame rather than around the edge. He’s separated the decoration into fields with the use of borders, larger triangles featuring in groups of two, and smaller in groups of three. My instinct is that they are the same size as the ones on the Hinson horn, but I’d have to measure them to be sure. The flowers/marigolds are within a knotwork band, I wonder if he got the spacing right this time, or if they get all mushed up together around the back somewhere to make it all fit. I think the majority of the stippling is red, the rest of the line work is black. The base has a simple circle and diamond grid design as it wouldn’t usually be seen. It looks like I have a couple of thousand photos from 2003, 2006 and 2011 to review soon to see if there are any other gems amongst them. * Australian punctuation used to commemorate Australia/Invasion Day. For discussion of the complexities of the observance of ‘Straya Day, see this post on the Australian National Maritime Museum’s blog. I’ll do the disclosure part first. The 1596 horn is to be auctioned on 24 November as lot 134 by Matthew Barton Ltd. I’ve been in contact with Matthew to discuss the content of the catalogue listing for this lot (go to p39), and have been given permission to use his photograph. He also provided the information on the 1599 Violet shoehorn below that was also missing from my catalogue. At no time was promotion or advertising requested and this post should not be construed as such. When I become aware of other Mindum horn sales, I’ll also mention them. I think this is a particularly significant horn for a couple of reasons that I’ll outline below. The finish of the horn isn’t as fine as his usual work. There’s a number of inked-in scratches meaning that either he didn’t polish the horn before starting, or it’s been reinked since. I think it’s the former due to the way the triangles along the top edge are worn and uncoloured. The location of the date isn’t quite right, it looks like he had planned to put it at the end of the inscription but then changed his mind after doing the text and put it in a more prominent location instead. He usually fills those sort of spaces with scrollwork. He’s also tried a different technique that I haven’t seen on any of the earlier horns. There’s a row of opposing triangles between the arches at the base and the lady. Rather than opposing point to point, these are wider spaced and the points of one row face towards the spaces between the triangles in the opposite row. He’s done a knife cut either side from the apex to the base, then a third across the base, slid the point in and lifted the piece. Slow, fiddly and not a particularly good finish. I can’t see it used on any of the later horns, but he does use the opposing facing triangles from 1597 on as far as I can see, every horn after that date. I’ve discussed the purpose-built tools I think he had made in a previous post. 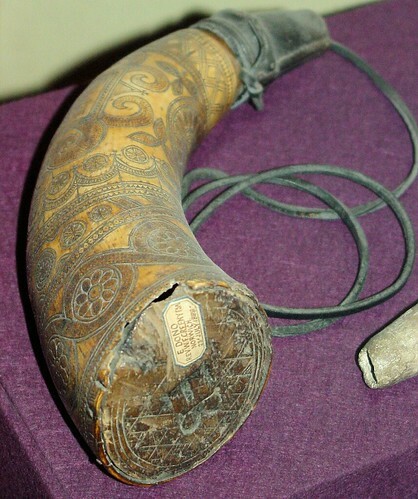 This horn appears to be missing at least a third, possibly more of its original length. This is normal for the horns that have been heavily used, due to wear from the coarse woollen stocks in use at the time – several others show similar amounts of loss. Looking at the decoration, there’s a row of opposing triangles across the top, that would normally separate another design area from what we currently have. For 1596, I’d expect at least an encrowned rose or fleur-di-lis at the end, and possibly a band of knotwork. This then gives us significantly more room for the inscription around the outside edge. The lady on his shoe horn looks very similar to the lady on the 1593 Jane Ayres shoe horn in the Salisbury Museum and appears to be wearing the same hat, not a particularly fashionable one for the period. I’ve haven’t seen the 1595 Jane Ayres shoehorn, it hasn’t been noted since 1921 but may feature another picture of Jane. I’ll owe an ale to anyone who can produce a picture of the later one. Crackpot theory time: let’s assume for the moment that this is Mindum’s own shoe horn. He’s done a picture of his sweetheart on it, arguably Jane Ayres. We know he married a woman called Jane some time prior to 1613 as he made (another?) shoe horn for her then. This is pure supposition drawn from idle speculation, but I would like it to have been true. The second horn escaped my attention mainly because the sale predated on-line catalogue distribution. It last sold in 1986 at Christie’s Important European Sculpture and Works of Art sale NINI-3357. I’ve attempted to contact Christies for more details or a better image but am yet to get a response. Thanks to Matthew Barton for bringing both these to my attention. I’ve just uploaded a new version of the Mindum catalogue, version 1.6. This will probably be the penultimate update before moving to a Wikipedia entry. There’s been a bit of activity since the last update, mostly to do with the Museum of London. Thank to some work done by Alex Chapman, we’ve been able to confirm the entire Evans collection of shoehorns and the 1601 Morris powder horn are in the MoL, along with all but one of the Drane collection. The 1597 horn with the scratched-out name that Joan Evans mentioned from the Drane collection is still missing but I’m hopeful about it turning up sometime. There was a bit of a kefuffle about the dating of Mathew Westefeldes’ shoehorn, with 1609 being suggested, but it turned out to be an incorrect record in one of the research files. It’s also been confirmed that the claim of an end year of 1623 from the VAM (Treasures of the Royal Courts… &c) was a typographic error and should have been 1613 as expected. I’ve added links at the end in a new section to the 18th C imitation by Thomas Gen in the BM that I think Joan Evans had been looking for but couldn’t find and to the seventeenth century shoehorn in the York Castle Museum that has been suggested as the one mentioned by Paula Hardwick. As usual, I’ve done the usual check for link rot and given the whole document an overall tidy up. This shoehorn is in the British Museum collection and to my mind is a clear imitation of Mindum’s work. Made by Thomas Gen, it was acquired by the museum in 1889 from the collection of Henry Christy. Click on the picture to open it in a new tab, there’s a few things to which I’d like to draw your attention. The first is that it isn’t finished, the inscription stops part way through. I think the rest of it is marked fairly faintly but is now too indistinct to read. There are mark up lines near the hole and the tip appears to have broken off, possibly following a crack from drilling the hole. I have no idea why it has been inked when the design isn’t finished. There’s no evidence of wear at the end or sides. The second thing is that the entire design is engraved. It’s been done with one or maybe two tools, almost entirely with point work. The triangles are done by pressing the point in, then levering up, leaving exactly the scalloped base shape on the triangles and uneven depth I was talking about in my study of Mindum’s method (he said, smugly). Dots are done by sticking the point in and then rotating it. Unsteadiness of the hand has resulted in the occasional straight lines radiating from the dots making them look a little hairy. Lines are done by dragging the point, resulting in wider lines where the point has dug in more, or with a sawing motion on shorter and curved lines, resulting in multiple over-runs in places like the fleur-di-lys and square knot near the tip and a faceted appearance on the circles. There are no centre marks in the circles and the circles are not concentric, so compasses have not been used in the layout. I must say, Mr Gen does a nicer job or laying out the knotwork than Mr Mindum ever did, they are beautifully central. Almost all of Mindum’s end up with the knotwork smacking into the right hand border. 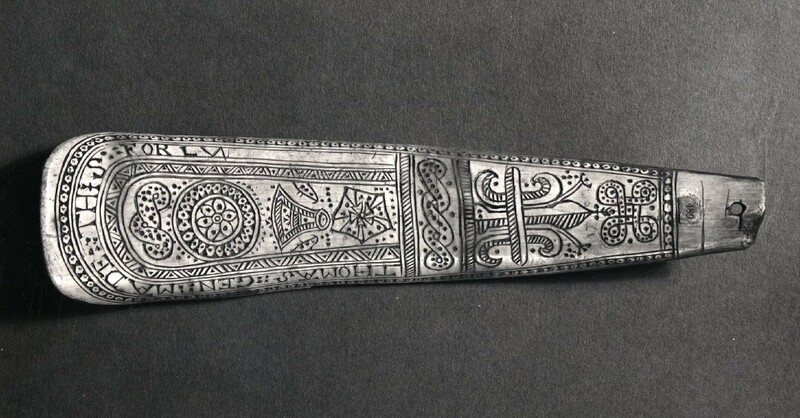 It has all the elements of a Mindum shoehorn, but the arrangement of knotwork above marigold above stylised crown with two horned ferrets coming in from the sides above cartoon rose doesn’t match any of the known surviving Mindum horns, and Mindum always uses the knotwork as a divider so I think the layout is original to Gen. The elements are so stylised, it looks as if he was working from a drawing or faint memory. Every triangle is different – size, angle, depth. Some of the small ones have ended up “T”-shaped as the point is stuck in deeply to form the base, but comes up too quickly and the point just scratches a line. Mindum’s are identical in size and depth, and has each group of three or four (depending on the triangle size)perfectly aligned. Lettering is composed of lots of lines, serifs are also lines with dug-out triangles, not the neat, identical triangles Mindum uses. The centre “v” if the A in MADE doesn’t even meet. Gen has matched Mindum’s small dash on the H and I but gone his own way with the lazy S.
The hatching, to be honest, is a bit of a hash job. Unevenly spaced, uneven line widths and depths and not always laid out to match the curve of the horn. Mindum had trouble with this layout, too, but his lines are even and parallel. Gen has had the same problem with finish as I did. The horn needs to be polished to the desired finish BEFORE starting the engraving (or burning). There’s marks all over the place that couldn’t be removed without messing up the engraving. Now have a look in the embiggened photo at the base of the fleur-di-lys. It’s about the spot where Mindum puts the year if he hasn’t put it in the main inscription. I can see 17-something lightly marked in there with a blade, I think it says 1790, but I may be wrong, what I’m reading as 9 could be the Elizabethan 2 with the big loop at the top. So 1720 at the earliest, but probably 1790. Obviously, this was done after the rest of the design was inked or it would show up darker. There’s no way to tell if it was the same afternoon or 120 years further on, but the width of the cuts does match the line width in the fleur-di-lys and it’s in the right location to be part of the original design. It’s a shame that there isn’t more words, we might have been able to pick if the inscription was modern English from post 1755 (Dr J’s Dictionary) rather than early modern. Joan Evans in The Burlington Magazine, November 1944, ‘Shoe Horns and a Powder Flask by Robert Mindum’ says that she believed there was a Mindum shoehorn in the British Museum, but at the time of writing her article, it was unable to be located. While museums do lose stuff all the time and catalogues are notoriously incomplete, there’s no official record of them ever owning a Mindum shoehorn and when they needed one for an exhibition recently, they had to borrow Matty Westfelde’s from the MoL. Could this be the shoehorn she’d heard about? 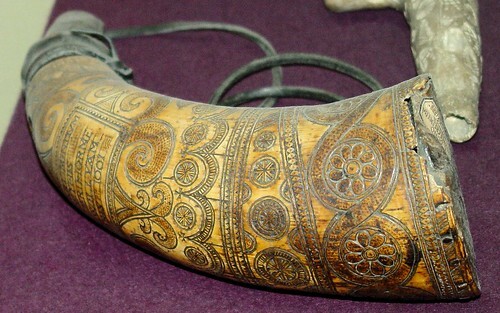 The dark tip of the horn shows that it isn’t ivory. So there you go, his middle name was Hendart. Unfortunately the top of the horn is off the page, I wouldn’t be too surprised to see that it had been worn away like on many of the other ones. I’ve added it to the Shoehorn Spotters’ List updated the catalogue. That makes 21. I’ll do a Wikipedia page on Mindum’s work sometime to see if that flushes out any more. There are four basic design fields, but unlike most of his other designs, there are no formal divisions between them. The nearest parallel is the treatment of the three goat heads logo on the 1593 Stetteson shoehorn. Two s-hilt daggers or short swords at the top, to either side of the tip of a large fleur-de-lys with two balls beside its base. Below that, a guilloche, one of his most highly decorated. The third virtual field is populated by a standing male figure in harquebusier armour, armed with a sword. Either side of his head are a rattle, link and lantern, possibly the accoutrements of a nightwatchman. Could “Go to Bed” be Robert’s nickname based on his late night call? Two indistinct initials either side of his legs, one of them may be “M”. In the fourth location is a tree, with two small figures standing underneath, could this be an allusion to Adam and Eve? Closing the decoration fields is a diagonally hatched band and at the bottom is a 5×5 checkerboard pattern. The hanging hole is in the centre line, and the tip is bent back to form a hook.